CRANSTON, R.I.-Cranston police officers rescued seven people from an early morning fire on December 25, 2015. 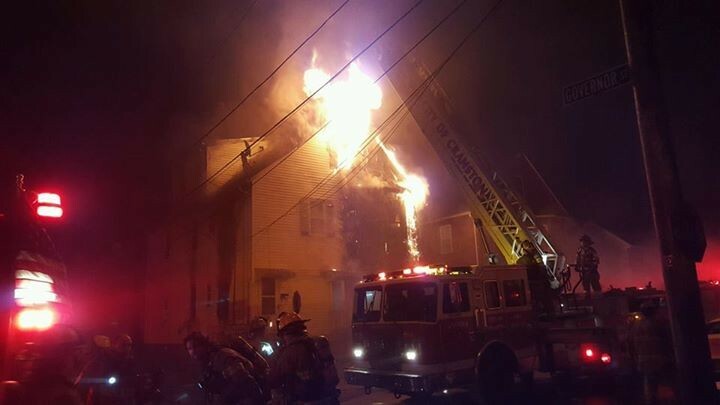 Third shift officers Brad Duclos, Jon Quaranto, Austin Smith and Michael Long were able to enter the smoke-filled house to wake and evacuate the residents of the multi-family home. The officers are members of IBPO Local 301. Most were unharmed, though one man sustained severe gashes on his arm from exiting the house through a glass window before the officers arrived on the scene. Once confirmed all residents were safe from the blaze, Officers Long and Duclos administered medical treatment to the injured man. The Standish Ave. residence is unfortunately a complete loss from the fire damage, but due to the quick actions of the police officers, all residents survived.